Now in one brief glance, size up your opponents! With the new Smart HUD, you can quickly learn your opponent’s tendencies on the spot, and use them to your strategic advantage. In Cash Games (excluding AoF) and Tournaments, the icon will display a player’s current VPIP percentage.VPIP stands for voluntarily put money in pot. In other words, this stat shows the percentage of time a player calls or raises pre-flop.Use this knowledge to adjust your game play and improve your odds.Just remember, everyone else can see your percentage as well! Regardless of game type, the outer edge of the Smart HUD Icon will be an illustration of a player’s current run.There are 4 levels, and the fierier, the better.Exploit those who are on a cold run or put a check to those on hot runs.The decision is up to you; but you may be able to make an informed decision using Smart HUD! The ” Smart HUD Box “Click anywhere in the avatar. The Smart HUD Box provides detailed statistics about the players around you. 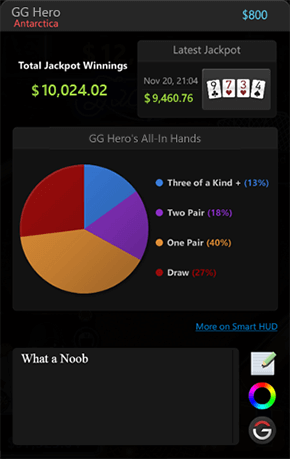 The Smart HUD Box in cash games shows how many hands you’ve played and won against a particular player. Your past records of the biggest pots against your opponent will be a quick reminder of your opponent’s tendencies and can also serve as a measurement of skill in comparison. 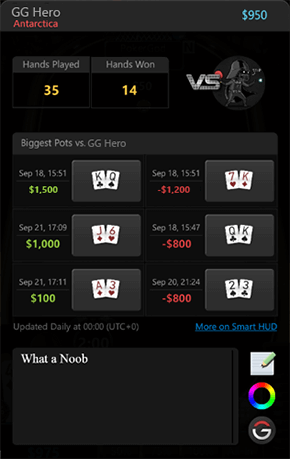 *Smart HUD Box data in cash games refreshes daily. 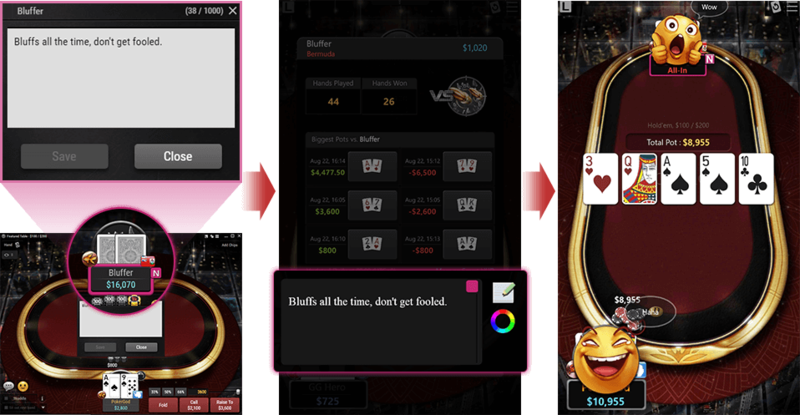 The Smart HUD Box in AoF will show three things : A player’s total jackpot winnings, their latest jackpot hands, and their hand distribution. Only one part of the puzzle is missing. Your finesse to pinpoint how strong or weak your opponent is when they are pressing the red button! 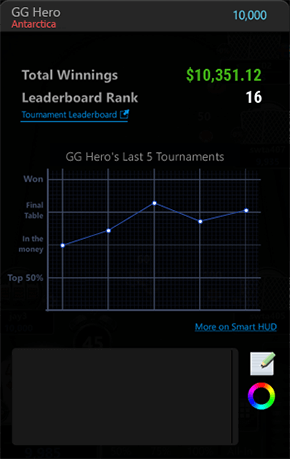 Tournament Smart HUD Box contains a player’s total tournament earnings, and their leaderboard rank. Past tournament placements will prove to be useful in evaluating your adversaries as well. Sidestep players on the rise while pushing others over the edge. With our one-of-a-kind universal player note, you can access your knowledge anywhere, whether it be on your mobile phone, your PC, or different devices!